Since the discovery of the wheel in deep antiquity, it has been inseparably linked to the use and generation of energy. Wheels to carry loads, wheels to lift loads, and wheels to turn the shafts of primitive machines have served us by multiplying any power that man could harness and divert to a task. In the middle ages, wheel driven cranes lifted heavy cargo on and off ships and raised massive stones hight into the air to build the european cathedrals. Water wheels, on the banks of streams and rivers, powered the belts ans pulleys which cut, drilled and shaped wood. In Köln, medieval floating mills crushed grain into flour more dependably than the wind of the North Sea. In the last few years Turbine generators have been improved to an extent that wind power can produce useful amounts of electricity. I believe that the constant and powerful flow of a major river combined with the leverage and inertia of a large diameter paddle wheel could easily do the same. The idea requires no scientific breakthroughs. The design would combine existing technologies in all aspects of it´s engineering. The wheel configuration also has some important advantages. 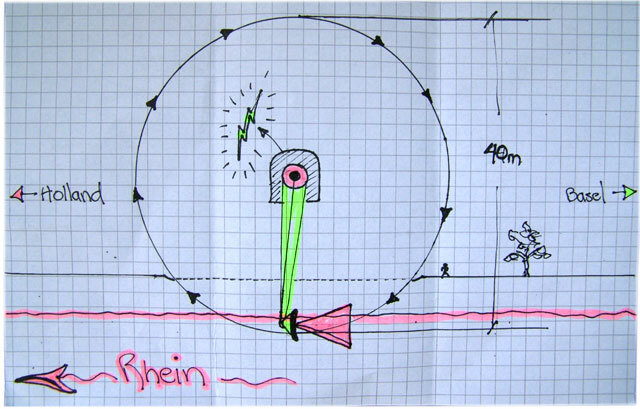 The full height of the wheel would begin at the water line of the river, making a 50m diameter wheel much shorter than a comparable wind generator. Wheel generators can be housed in self-cleaning glass enclosures to protect the mechanism from the elements and minimize the noise of the turbines. Two or more wheels can work side by side, staggered, or in sequence without reducing eachothers capacity. Last and perhaps most imortantly, from Vienna´s famous Prater, to London´s Millenium Wheel or amusement park Ferris wheels; Large wheels do not seem objectionable to the inhabitants of major population centers, where power requirements are the most critical. One can envision a glittering glass construction at a fast running curve in the river that housed perhaps three bright metal wheels, quietly turning day and night like some fantastic transparent clockworks, while converting a powerful natural resource into a limitless supply of light and energy.